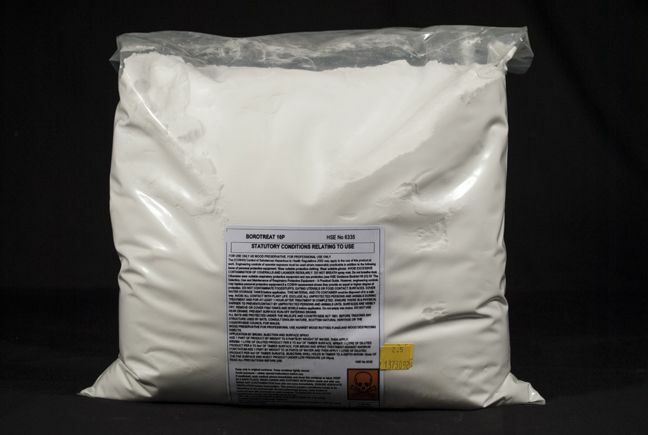 Borotreat 10P is a multipurpose powder concentrate for use as a wood preservative. It is a very effective fungicidal and insecticidal control treatment, which will also prevent re-infestation. Borotreat 10P is suitable for all wood, which is not in direct contact with the ground or exposed externally. Borotreat 10P is supplied in convenient pack sizes as 100% w/w Disodium octaborate tetrahydrate ( Na2B8O13·4H2O ) as the active ingredient. It is easily diluted with water and provides permanent protection, as the active ingredient does not break down. Dilute Borotreat 10P 1 in 9 with clean tap water to give a 10% active working solution*. Borotreat 10P is supplied in convenient pack sizes of 0.1, 0.5 and 2.5kg to make 1, 5 or 25 litres of diluted product respectively. Use an oversized bucket or container with the appropriate volume of clean tap water and add the corresponding amount of powder concentrate. Mix the powder into the water with a suitable paddle during addition and continue until it has completely dissolved. Use warm water if possible to help the powder to dissolve. The working solution of Borotreat 10P can be applied by brush, spray (microblower) or injection. 1. Clean all wooden surfaces using a brush or vacuum cleaner. 2. Cover electrical installations, water tanks, stored goods and isolate adjacent areas not requiring treatment. 3. Lift floorboards as required and clean out debris. 4. Treat all accessible areas with the working solution of Borotreat 10P using brush or spray (microblower). 5. Under normal circumstances one coat will be sufficient but ensure that all accessible wood surfaces are thoroughly wetted out. Any surfaces that absorb solution rapidly should be sprayed again at the time. 6. Apply a second coat after one to eight hours where there is a severe fungal attack or woodworm infestation. Indefinite shelf life in unopened, sealed packs or containers. Store in the original packaging, unopened or sealed in a dry, safe place. Borotreat 10P is approved under the EU Biocides Product Regulations for use as directed. Authorisation Number: UK-2014-0872. Refer to Safety Data Sheet (SDS) for the product. Contains: 100% Disodium octaborate tetrahydrate. Use only as a wood preservative. Keep away from children and always read the label.